First line: "The afternoon my parents died, I was out shoplifting with Irene Klauson." Emily Danforth offers a sensitive and detailed portrait of Cameron Post, a young woman growing up in rural Montana, slowly coming to terms with her gay identity and the relationships with her family and friends throughout her youth. This is a heartbreaking book. It's a long book - clocking in at a whopping 470 pages it's a real door-stopper. I think that alone will dissuade a lot of readers. But, for those who aren't put off by the length and enjoy a good slow wallow in sad feelings, this is a perfect read. 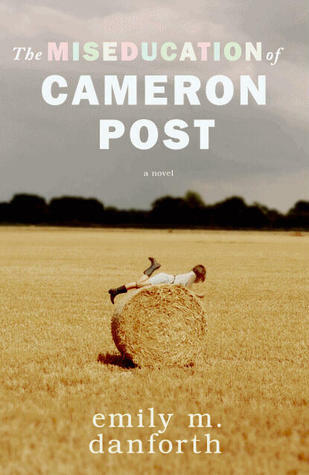 Cameron painfully blames herself for her parents deaths and silently suffers with her miserable, religious spinster aunt. She eventually finds refuge with her high school swim team, but as rumors start to swirl about her sexual identity, she finds her aunt all-too-ready to ship her off to a camp to cure gay teens, while Cameron's feminine girlfriend pretty much gets off scot-free. The truly horrifying thing is that the characters are all so nuanced and so real. Danforth could have easily made this story into a Dickensian dystopia, but refrained from doing so. The administrators at Promise, the de-gaying camp aren't monsters. They are all genuinely nice, yet terribly misguided people who honestly believe they are doing the right thing and in their own way are trying to help others. Cameron falls into a rhythm at the camp, discovering small ways to rebel, but ultimately, she ends up playing a waiting game, waiting to turn 18, so that as a legal adult, they'd have no right to detain her. Danforth's beautiful writing accurately captures the stark feel of the prairie. Again, the length and the slow pacing were super challenging for me, but interest in this book may be piqued once it is released as a movie.